The THERMOTEC W construction method is heat insulation paving that inhibits the rise in temperature of the paving surface in the daytime by reflecting the near-infrared rays which make up approximately half of the solar radiation energy amount. 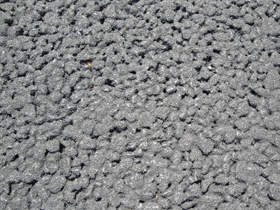 This heat island countermeasure construction method is applicable to porous asphalt paving. 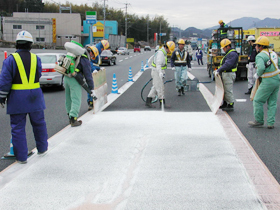 By applying a two-part hardening type resin (coating type) to the road surface, it can be given a function which inhibits the rise of the road surface temperature. 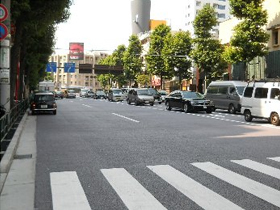 On sunny days in summertime, a road surface temperature-lowering effect of a maximum of around 12℃ can be expected. Because the road surface temperature will be reduced and the paving surface radiant heat will be lessened, this will mitigate the uncomfortable heat that is felt by pedestrians and people living along the road or path. Since the amount of heat stored inside the paving will also be reduced, the heat environment in summertime will be improved, and mitigation of the heat island effect can be expected. Because coloration can also be applied according to the application, improvement can be expected in the landscaping and visibility. The scattering of aggregate can also be limited. The opening to traffic at an early period will be possible.